Addie’s granddaughter, the author, is the real subject here, in a delicate exploration of growing up that gives weight to the land, to the economy, to the river, and most of all, of course, to complex family relationships. “An autobiography that begins with one’s birth begins too late,” says the author, because all the forces that will shape you, cosmic or human, are already in place at the moment of birth. So Settle (Choices, 1995; Charley Bland, 1989; etc. ), winner of a National Book Award, lets her autobiography become a memoir of her maternal grandmother, Addie, and of the family homestead in West Virginia that was paid for by salt mines and coal mines. Addie came to the homestead by way of a first marriage that produced three daughters and three attempts at suicide on her part. She was rescued—at one point literally carried off when her husband tried to kill her—by the man who owned the homestead, the man who was her lover and by whom she was already pregnant with Settle’s mother. Having obtained a divorce, Addie took charge of her new home, of her beloved second husband, and of the little land that had not already been leased to the coal companies. There were family tragedies: Addie’s oldest daughter, Minnie, was a morphine addict, so adept that she could “drive the hypodermic through her dress . . . as she sat beating egg whites. . . .”; the husband let himself be run over by a train, although Addie would never concede suicide. Politics also becomes personal: Mother Jones, the almost mythical labor organizer, is a real person here, proselytizing the coal miners of the Kanawha Valley. Addie, at some risk, loaned her a field to hold her meeting. 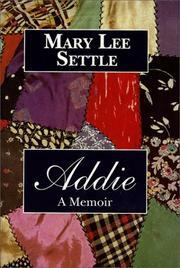 Addie, her children and grandchildren, her in-laws and outlaws (the paternal side of the family) are all aspects of the child, the adult, the novelist that Mary Lee Settle became. The author captures them in a kind of chorus of life and death that has now set her free.